The renovation of the facade of the former hospital of the Holy Trinity in Broniszów, Lubuskie voievodship, Poland (entered in the register of monuments under No. 293) was completed in December 2014. In addition, the restoration of stone bas-relief with the presentation of the Holy Trinity and sandstone statue of St. Constance and St. Catherine (entered in the register of monuments under No. LB-133 / pos. 1-3, which are elements of the historic building facade design) was also finished. Holy Trinity Hospital was built in 1765 as a foundation by Katarzyna Skrońska, the owner of the nearby castle. 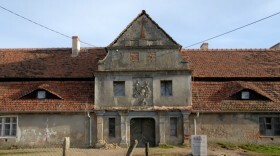 The building of the Hospital can be described as an example of social building which was created by a woman possibly to be used by women of the village. Truly feminist foundation! The former Hospital was designed in the Baroque style, on the plan of an elongated rectangle. 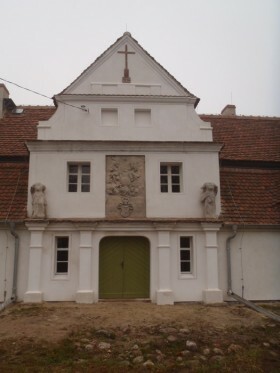 Above the entrance, there is a stone plaque with a relief depicting Holy Trinity containing - at the bottom - the coat of arms of the family von Skronsky and engraved foundation inscription. A late baroque bas-relief was made of sandstone around 1765, the year of construction. On the facade of on the main axis of the hospital above the entrance there are statues of St. Constance and St. Catherine. 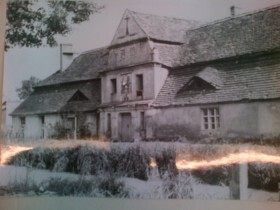 This composition can be seen on archival photographs from before WW II. These sculptures were dropped from the facade of the hospital after 1945. Late baroque statues of female figures standing in contrapposto were also made from sandstone in 1765. On their basis there are inscriptions indicating the names of the women saints. Both figures, headless, required to undergo full conservation work. Also bas-relief panel with representation of the Trinity had numerous defects and damage. What's more, the entire facade was significantly damp, with numerous layers of plaster defects and poor conservation status of the walls. Accordingly, it was considered necessary to protect historic substance against further damage and destructive processes, as well as to undertake restoration of lost artistic value and aesthetic properties. At this stage, isolating the foundation of the house was made. The renovation of the basement area was undertaken on architectural detail (cornice and pilasters flanking the entrance to the building). In addition, in the rear facade returned to original rhythm of windows, which is maintained in the form of blends, in order to show the evolution of the building and transformations over the centuries. The renovation of the existing window frames from the early twentieth century was undertaken. 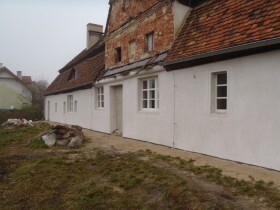 As a result of conservation research the original color of the outside walls was also determined. In the next stage, the owner plans to continue the restauration project, including inter alia, the painting and restoration of the façade as well as renovation of illusionist windows which were discovered during the research. Summing up, the owner completed research and conservation work on the stone relief with the presentation of the Trinity and stone sculptures. The figures and bas-relief stone were restored to its former glory, their artistic values were fully revealed. As a result of the efforts of the owner of the building, figures - after decades - returned to its original place. Although at the significant detriment (both forms are devoid of heads), they stand as a testimony to the history of the buildng and the fate - movable monuments on Lubuskie region (part of historic Lower Silesia) suffered. The project constitute an unusual example of a successful restoration of a historic building of high artistic value. The work was co-financed by the Polish Ministry of Culture and National Heritage.